Saudi and the UAE may be the region's largest investors in clean energy, but they are not the only ones in the Middle East bringing solar projects to the fore. 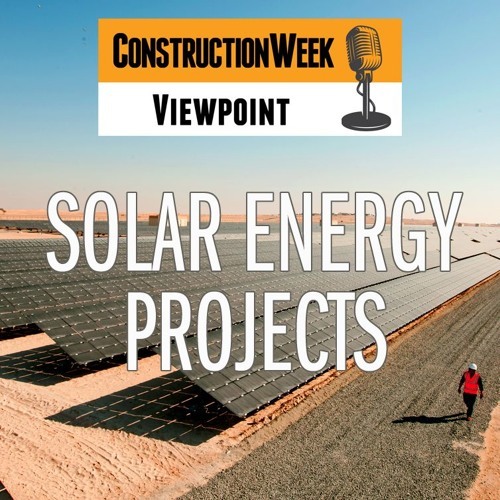 In the third episode of the Construction Week Viewpoint SoundCloud podcast, the rise of solar projects, and the need to facilitate these developments by investing in proper infrastructure is discussed in the latest on-the-go podcast. One of the biggest projects underway is the Mohammed bin Rashid Al Maktoum Solar Park, a central pillar of Dubai’s long-term renewable energy strategy. The podcast is hosted by Construction Week’s deputy editor, Oscar Rousseau, and ConstructionWeekOnline’s editor, Jumana Abdel-Razzaq. Listeners can tune in from their phone, desktop, or tablets at noon every Monday to learn more about the biggest issues in the business.